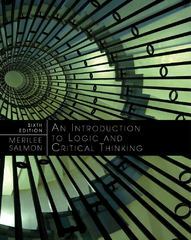 Introduction to Logic and Critical Thinking 6 Edition Designed for students with no prior training in logic, INTRODUCTION TO LOGIC AND CRITICAL THINKING offers an accessible treatment of logic that enhances understanding of reasoning in everyday life. The text begins with an introduction to arguments. After some linguistic preliminaries, the text presents a detailed analysis of inductive reasoning and associated fallacies. This order of presentation helps to motivate the use of formal methods in the subsequent sections on deductive logic and fallacies. Lively and straightforward prose assists students in gaining facility with the sometimes challenging concepts of logic. By combining a sensitive treatment of ordinary language arguments with a simple but rigorous exposition of basic principles of logic, the text develops students' understanding of the relationships between logic and language, and strengthens their skills in critical thinking.